With 358 families in great need of recovery help as of Aug. 1, the Conference’s Disaster Response Ministry is appealing for volunteers to work before year’s end. As of Aug. 1, OKUMC-DR reported, only two such groups were scheduled. Major grant funding will end Dec. 31. 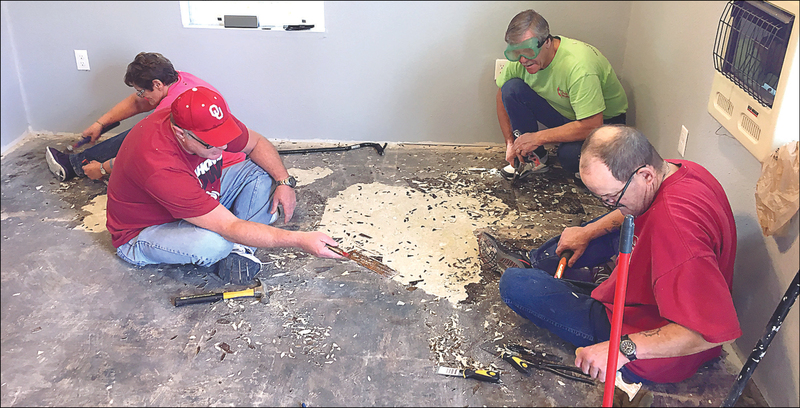 According to Chad Detwiler of the Disaster Response staff, dozens of the home repair projects already have been funded, but the extent of the work will require volunteers as well as professionals. He said 27 teams have helped this year through OKUMC-DR. Oklahoma United Methodists comprised eight of those. Statistics list 111 tornadoes and record rainfall of 53.71 inches in Oklahoma in spring 2015, with damages in 66 counties. "The challenge comes for us in keeping people aware of the continued need long after a disaster," Detwiler stated. The commitment to long-term recovery help is part of United Methodism’s DNA. "Staying Until Recovery Is Complete … That’s Church!" is the rally call. "Jesus challenges us to live a life of service, to help those who are in need," Detwiler wrote in an e-newsletter. "We therefore continue." Volunteers are most needed for four types of projects: roofing, drywall, flooring, and siding. "Many of you have volunteered with us already, some multiple times, and for your service we are grateful. Ecclesiastes 4:9-10 says, ‘Two are better than one, share the work...’ We know we cannot accomplish all that is needed in recovery without you." Bartlesville United Methodist volunteers find themselves sitting down on the job for a flooring project.